Below are some calendars with pictures of the UK, or British themes. Scotland is a magical country with deep roots, hidden history and fascinating traditions. National Geographic Scotland 2019 provides you with a glimpse of some of Scotland's most beautiful and inspiring landscapes. From picture-perfect Edinburgh to the rugged Highlands, this collection of photographs truly captures the enchantment Scotland is known for. 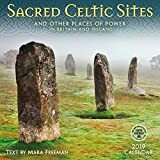 Sites included in this year's calendar are: Ardvreck Castle, Sutherland; Rua Reidh Lighthouse, Melvaig; The Old Man of Hoy, Orkney archipeago; Neist Point, Isle of Skye; Dunrobin Castle, Golspie; Trotternish Peninsula; Dunnottar Castle, Aberdeenshire; The Abbey of Dulce Cor, Dumfries and Galloway; Glen Affric National Nature Reserve; Tobermory Harbour, Isle of Mull; Glenfinnan Viaduct, Inverness-shire; Dugald Stewart Monument, Edinburgh. Each outstanding image is accompanied by a large grid with moon phases and international holidays. National Geographic supports vital work in conservation, research, exploration, and education. This calendar includes a 3-year at-a-glance page and is earth friendly, printed with soya-based inks on FSC certified paper. 13 x 12 inches (opens to 13 x 24 inches). England’s railways were once run by dozens of companies, but out of World War I came the Big Four, which for the first time divvied management of rail lines geographically. Each had lines fanning out from London to their designated region and tried to attract riders with posters advertising pastoral scenes, charming villages, or flashing views of the capital. New locomotives continued to impress, and trains became ever faster. But rail travel declined as the automobile prospered, and the prewar glamour eventually faded. Profits were few and only the Southern Railway invested, electrifying some of its commuter lines. By 1948 the railways were nationalized. The posters in this calendar compose a snapshot of rail travel within England during this period of change, a romantic vision of sophisticated country escapes and city grandeur. With over 2,000 years of history, London stands at the Prime Meridian and boasts centuries of stunning architecture, renowed museums and world-class theatres. 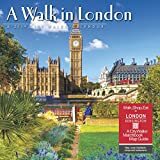 Set your watch to Big Ben and revel in the richness of one of the greatest cities on earth as you stroll along the River Thames to visit Tralfagar Square, Buckingham Palace and the London Eye. The included pocket-sized map features a detailed walking route of a popular neighborhood along with a directory of its sights, shops, restaurants and hotels. The large format features location captions, inset images and grids with ample room for jotting notes and reminders. Also included are moon phases (CST), U.S. and international holidays. Sir Simon Marsden's atmospheric black-and-white infrared photographs reveal the hidden supernatural world, transporting the reader to a different realm — a haunted realm. 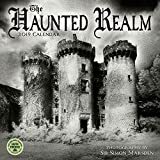 In The Haunted Realm wall calendar, Marsden's ghostly images are accompanied by literary excerpts and historical accounts as well as tales of apparitions and the paranormal that have been reported at the sites and the strange events said to lie behind them. A year of spooky photographs on your wall. The perfect gift for the supernatural enthusiast. Showcases 12 atmospheric black-and-white infrared photographs of haunted houses, imposing castles, graveyards, mysterious tombs, dark towers, and romantic ruins. Features historical accounts by Simon Marsden and literary excerpts from writers such as Thomas Gray and Shakespeare. Simon Marsden was an internationally acclaimed photographer and writer from Great Britain. His books include This Spectred Isle, The Haunted Realm, and The Journal of a Ghosthunter. His final book, Russia: A World Apart, was published posthumously. His work can be found in the J. Paul Getty Museum in California and in London's Victoria and Albert Museum. This wall calendar brings together a striking collection of historical photography from IWM collections from the Second World War, encapsulating the fighting spirit of the Allies. 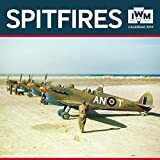 Featuring the most iconic plane of the War, the legendary Spitfire, some of the months also offer a glimpse of the heroic people who made up the Squadrons. Informative text accompanies each work and the datepad features previous and next month’s views. Flame Tree: The Art of Fine Gifts. Flame Tree Publishing has produced calendars and diaries for over twenty years. Now the UK’s premier art calendar producer, we work in the global market online and in retail. Each year we spend many hours creating new designs with artists, photographers, licensors, museums and galleries to bring beautiful art into the homes and offices of our customers around the world. 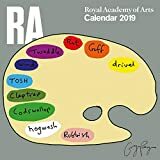 Featuring the superlative work of 12 Royal Academicians, including such fantastic talents as Anthony Whishaw, Gilbert & George and Grayson Perry, this RA art calendar displays bright and beautifully executed pieces that are to be enjoyed by all. The datepad features previous and next month’s views. 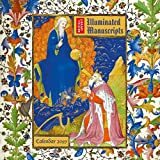 With their decorations, images, bright pigments and finishing touches of gold leaf, illuminated manuscripts are beautiful objects page by page. Drawing from the British Library’s extensive collection, this wall calendar features 12 stunning and intricate details. Whether familiar with medieval history or an appreciator of fine craftsmanship, this beautiful calendar provides a visual treat. Informative text accompanies each work and the datepad features previous and next month’s views. Deluxe England 2019 Wall Calendar. A year of stunning England images. 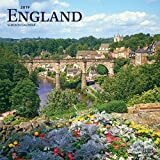 Perfect as England office decor, gifts, office supplies and desk accessories.